I was among the pioneer students of this workshop and would gladly recommend it to any aspiring creative writer, regardless of whatever genre your interest lies in. It was there that I met Tolu Ogunlesi, Jumoke Verissimo, and Eghosa Imasuen, who was in fact my roommate. 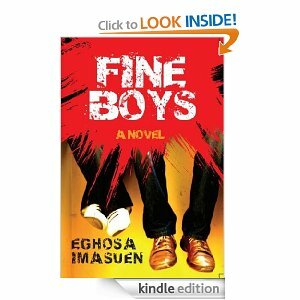 Eghosa has just published his second novel, Fine Boys, which seems to be the rave in town. And guess what? It was published by Farafina Kachifo. And, of course, I meant the awesome Chimamanda Ngozi Adichie and the so-incredible Binyavanga Wainaina. Farafina Trust will be holding a creative writing workshop in Lagos, organized by award-winning writer and creative director of Farafina Trust, Chimamanda Ngozi Adichie, from August 14 to August 24 2012. The workshop is sponsored by Nigerian Breweries Plc. Guest writers, including the Caine Prize-winning Kenyan writer, Binyavanga Wainaina, and Jeffery Allen, will co-teach the workshop alongside Adichie. All material must be pasted or written in the body of the e-mail. Please DO NOT include any attachments in your e-mail. Applications with attachments will be automatically disqualified. The deadline for submissions is June 25 2012. Only those accepted to the workshop will be notified by July 31 2012. Accommodation in Lagos will be provided for all accepted applicants who are able to attend the ten-day duration of the workshop. A literary evening of readings, open to the public, will be held at the end of the workshop on August 24, 2012. 4. A writing sample of between 200 and 800 words. The sample can be either fiction or non-fiction. Thank you! I think that your blog is very interesting. A large number of talented students engaged in writing activities. But I'm working and I have to ask for help uk essay writer .And professionals were doing everything instead of me.